Charleston has long been a destination for romantic weekenders, history buffs, and cultural enthusiasts, and in recent years it has grown to become an international destination for travelers from around the globe. It's art scene, culinary options, and traditional architecture make it a favorite among many travelers. The hotel scene makes use of the local architecture and there are many boutique style hotels in the historic center of the city. These hotels are each unique in there own ways and offer easy access to the city's walkable downtown area. 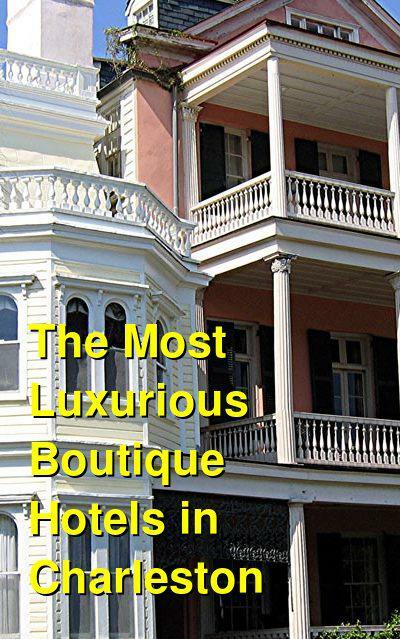 This luxurious inn is located in the historical downtown area of Charleston. It's a romantic hotel with a lot of style and many interesting amenities for guests. You can enjoy the beautiful view from the rooftop terrace or you can have a delicious meal at the hotel restaurant. There is wine and cheese served every evening as well as champagne in the afternoon. Guests also enjoy a complimentary breakfast every morning as well as a business center and complimentary wireless internet access in public areas. There are 50 guestrooms that are comfortable and beautifully furnished. There are a wide variety of room types to choose between that range from traditional queen and king sized rooms to full suites. In the Grand Market View Terrace Suite you'll have two queen size beds, a fireplace, and a large terrace that looks out on the Charleston City Market. If you're looking for a luxurious and unique place to stay in Charleston then you'll truly love the French Quarter Inn. It's a favorite hotel of frequent visitors to the city and it will ensure that your trip is comfortable and rewarding. This luxurious hotel is centrally located in one of the most famous parts of Charleston. It is right in the heart of the historic part of the city and is surrounded by shops, restaurants, and sights. Within walking distance you'll find St. Mary's Roman Catholic Church, the College of Charleston, and USS Yorktown. The hotel gives guests the convenience of a hotel with the comforts of an apartment. There are 16 suites that are fully furnished with modern kitchens, beautiful decor, and a lot of style. The rooms have washers and dryers, wireless internet access, complimentary newspapers, and dishwashers. During the evenings guests can enjoy wine and cheese receptions and a social setting. This is a great hotel, whether you're celebrating a honeymoon, anniversary, or a nice romantic weekend. 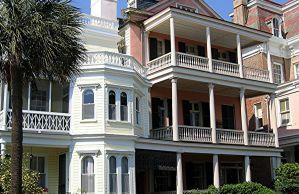 It has the charm of Charleston with the modern comforts of a luxurious hotel. Located in historic Charleston, Zero George Street is surrounded by the most popular restaurants and attractions in the city. The hotel is designed to accommodate all types of travelers, from romantic weekenders to business travelers. The building dates back to 1804 and is surrounded by trees to create privacy. All of the 18 rooms and suites are decorated with unique elements that highlight the area's architecture and style. There are pine floors, high ceilings and detailed decorations. As guests arrive they enter the "heart" of the house which is the original kitchen carriage house. It now houses the reception area. There are two restaurants located within the hotel as well as a coffee shop and a lounge. A complimentary breakfast is provided to guests as well as a light evening course. This hotel combines southern charm and architecture with modern comforts including wireless internet access and business facilities. This luxury hotel in Charleston is an elegant and contemporary option for visitors who want southern hospitality in the perfect location. It's surrounded by some of the city's best restaurants and cultural attractions as well as the waterfront and Waterfront Park. The hotel has 52 rooms that include 32 rooms with views of the water. There are also suites that are laid out specifically for guests who want a little more room. Hotel amenities include breakfast delivered to your room, snacks and iced tea in the lobby, afternoon wine and cheese in the Atrium Lobby, homemade cookies and milk, and fresh coffee. Each room is uniquely designed with southern details and modern amenities. The Vendue is actually two hotels located across the street from each other. 19 Vendue is situated within several historic warehouses that date back to 1780. It has guestrooms available. 26 Vendue is made up of two separate warehouses that originated in the 1800s and has 39 guestrooms. Every room is unique in layout and style. These hotels were recently renovated in 2014 and are now dedicated to the arts in Charleston. The decor includes more than 300 pieces of original art and there is an exhibition space that displays local work. If you're looking for a unique culinary experience, there are three different dining options which include The Drawing Room, The Rooftop, and The Press.